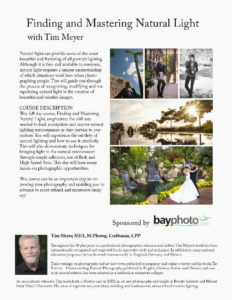 Tim is doing an all day seminar on Sunday the 18th and an evening program on Monday the 19th. You don’t want to miss either one. The All day program is free to GCPPA Premium Members and $49 for regular members. Non Members $89. Seating is limited in this class so sign up now. To sign up email Michael Collins at michael@collinsfoto.com or call 805-733-5197.